Astrid Cloverleaf: a knitting persona blog: Week #1: New to Camp! Part 1: "What's in your trunk?" I am an overachiever and went for a full black-out.. or at least I'm trying to do so. Some of these are hard to find! My spoiler is Felly Pinkstone (dreamwalker on Ravelry). She's got some cool stuff in her queue/ favorites. I really dig these socks, the Mirabella Socks, and even added them to my favorites! Perhaps one day I will finish a pair of socks completely. I ususally finish one, cast on for the other, then start on a new project. My spoilee is Winnie Wartbobble (MissWartbobble on Ravelry) and there are quite a few projects in her queue/ favorites that I have in mine. 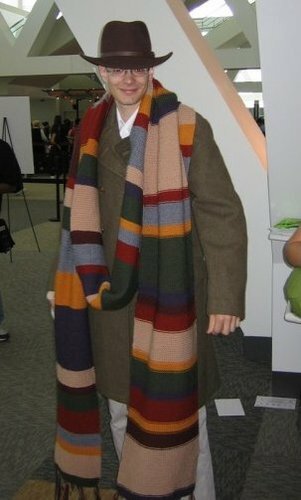 My favorite non-duplicated project is the Doctor Who scarf. My fiance has been asking for one for ages! I don't have the patience to knit knit knit knit.. and knit some more for it.. plus, he doesn't wear scarves! I am thinking that he's getting a Dalek instead..
it was so hard finding someone with more than me.. so yes, thank you! :) i keep everything in my faves and when i cast on they go into my projects or queue.. you're awesome!